6 plus 6: Cloud Certifications: Constraint or Opportunity, Must or Gadget? Cloud Certifications: Constraint or Opportunity, Must or Gadget? it's the only way to keep a Partner status or a right to resell the product. the certifications' content is not in line with "real life" and thus, is perceived as meaningless. [Q1] Is the Vendor's [Cloud] Partner Program truly adapted to your Business Model? Some programs allow a fine grained adaptation of the criterias that allow access to the program/specialty and of the associated benefits. Cloud Builder: The Cloud Builder terminology is now used by our whole Industry to designate companies that are experts in designing, architecting, implementating Private and Hybrid Clouds. IBM VADs can also access this Specialty as they support Cloud Builders. 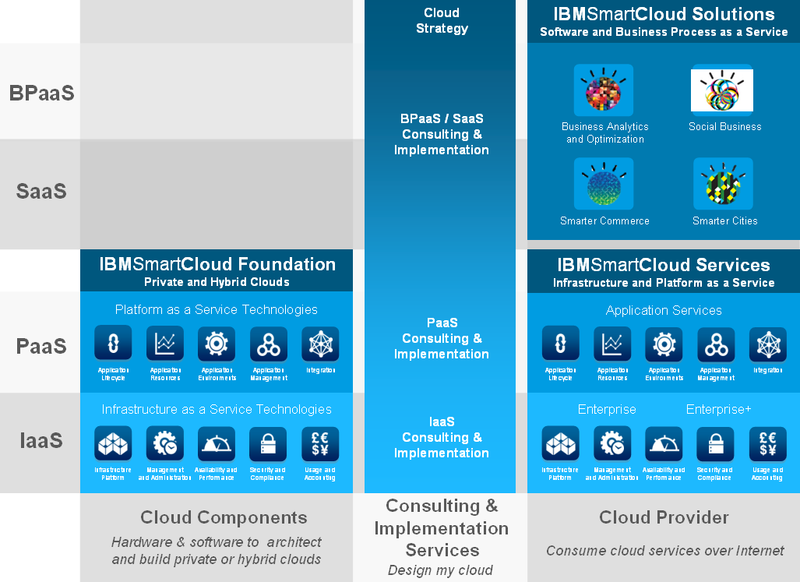 Cloud Infrastructure Provider [MSP/CSP, focused on IaaS and PaaS], and Cloud Application Provider [SaaS ISV]: According to IBM, these 2 models are very different and it's better to separate them than to mix them under a more generic "Cloud Service Provider" model. 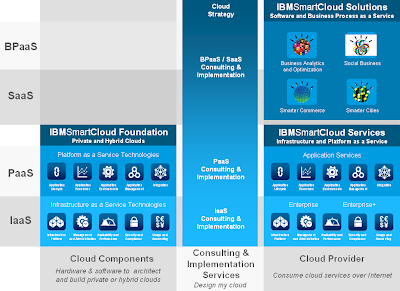 Cloud Services Solution Provider: IBM has chosen this name to stress the "Solution" focus that Cloud Partners need to have. But this expression (a) may be confused with Cloud Service Provider (b) is too long [4 words is at least one too much!]. 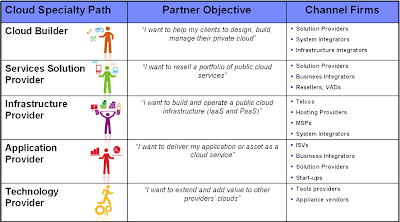 The Cloud Industry talks about "Cloud Broker", "Cloud [or SaaS] Integrator", "Cloud [Services] Reseller"] to designate companies who provide services and solutions around IaaS, PaaS or SaaS Public Cloud Services which they typically also resell/leverage. 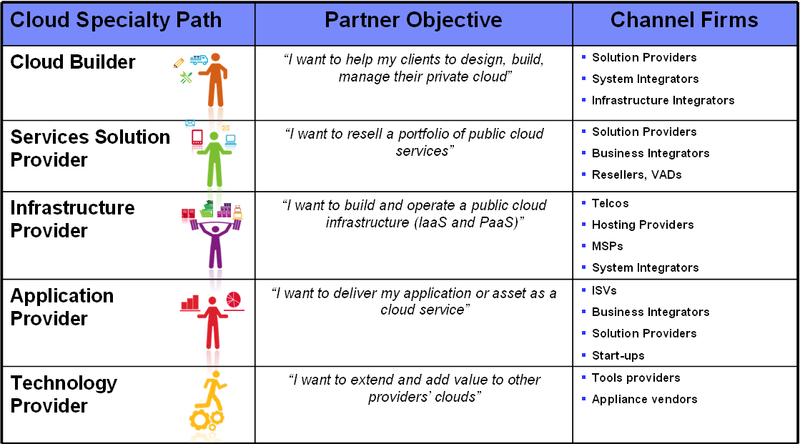 To get access to the IBM Cloud Specialty, Partners need to meet criterias that are adapted to each of the 5 business models. A least of of their customers has successfully implemented a private cloud infrastructure with their help and is ready to testify. These criterias are different from those required from an MSP, an ISV or a reseller. Look for more details on the IBM Cloud Computing Specialty website. simplified access to IBM experts, including IBM Labs specialists. [Q2] Do the Sales and Technical Certifications have a real value for your company and its employees? grow your sales and technical staff relevant skills and knowledge. give prospects, vendors and partners confidence in your ability to implement the right sales and implementation methods for the vendor's flagship [cloud] offerings. Cloud Certifications: Must or Gadget? Cloud influences decisions for many projects that are not even seen as Cloud. Several of your peers have already started their Cloud journey and you don't want to miss the boat or to be relegated in the followers pack. IBM Partners, contact your IBM representative or you VAD to get access to the IBM Cloud Computing Specialty!